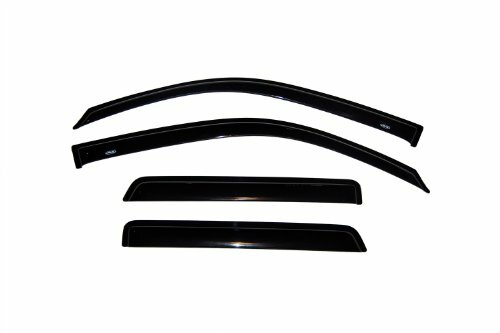 Our “Original” signature Ventvisor Side Window Deflector is made in the USA and precision-engineered for an exacting fit to the broadest range of vehicles on the market today. AVS Original Ventvisor’s customized design mounts in minutes to the outside of your vehicle using pre-applied 3M automotive-grade adhesive applied above and around your windows. It's a quick, no-drill installation to create a perfectly snug and secure fit – completely safe for car washes too! The Ventvisor, also referred to as a side window deflector, window shade or rain guard, allows fresh air to naturally circulate through open windows while keeping the rain out. Additionally, the product keeps the sun out of your eyes, enables fresh air circulation to eliminate stale, smoky air and allows you to keep your window cracked while parked, keeping the interior cooler. Now, you can truly enjoy the fresh air and whatever nature sends your way! If you have any questions about this product by Auto Ventshade, contact us by completing and submitting the form below. If you are looking for a specif part number, please include it with your message.